This document shall regulate the use of all products and services provided by Djikic Software Development (hereinafter: Provider) to users (hereinafter: User) through the WBSP.COM System (hereinafter: WBSP), as well as the use of the web space located on the located on the server app.wbsp.com (hereinafter: Server), for the purpose of posting their own content (User Content). 1.1. This document shall regulate the relations, rights and obligations connected to providing WBSP services by the Provider and its use by the User. 1.2. The User guarantees that he shall be fully capable to enter into a business relation with the Provider and that by using the WBSP service, he shall accept the conditions, obligations and guarantees and other statements made in this document. 1.3. Should the User initiate and use the WBSP service in the name of a legal entity, the User guarantees that (a) he is authorized to represent that legal entity and conclude contracts and sign legal documents in the name of that legal entity and (b) he accepts that hereinafter the word User shall apply to that legal entity, and not to him personally. 2.1. As part of the WBSP service, the Provider shall provide a web space on a WhizBase enabled web server, with shared server license. 2.2. The Provider shall give User access to FTP server (File Transfer Protocol), which shall enable the User to add, modify and delete the programming code and all other parts of User’s solution independently, and without Provider intervention. 2.3. The Provider is in no obligation to fix any errors that occur as a result of User’s altering presentation. 3.1. Registering and renewal of the domain is sole responsibility of User. 3.2. The domain registration shall be conducted in compliance with the Terms of Service of the Registry and the Uniform Domain Name Dispute Resolution Policy, which the User shall accept by using this service. 3.3. The Provider shall not verify the legality of the domain name chosen by the User and shall not be held responsible towards third persons and/or the User for the possible injury of their rights and/or possible harm and/or costs ensuing as a result of the registration and use of the domain name and/or as a result of a dispute between the User and a third person. 3.4. The User is fully and personally responsible for the domain name choice, the legality of the domain name choice and use, injuries of third person rights caused by the domain name choice and use (especially rights of the name, firm, stamp and other intellectual property rights), the harm to third persons caused by the domain name choice or use. 3.5. The User guarantees that his domain use shall not infringe any copyrights, a patent, brand, business secret or any other intellectual property or property right, nor that he shall injure any other right of any other person, including, but not restricted to any kind of contractual, statutory or other rights guaranteed by law or defined by common moral norms. 3.6. The Provider shall have the limitless discretionary right to make the domain unavailable and interrupt the data publication related to the domain, to erase all data from the Provider's servers and conduct all other activities he considers necessary, instantly and without prior warning, in order to harmonize the domain use with the Uniform Domain Name Dispute Resolution Policy, in case that the content connected to the domain or the domain itself injure the rights referred to in paragraph 3.5, or if there is a real reason to believe that these rights might be injured. 3.7. In the case referred to in paragraph 3.6, the User shall presently and for all times renounce all rights to request any kind of moral or material compensation from the Provider for any kind of losses and/or harms that may ensue as a result of implementing paragraph 3.6. 4.1. It shall be exclusively the User's obligation to provide User Content necessary for activating and using the WBSP service. The Provider shall not in any way be held responsible for the accuracy of the User Content in the linguistic, legal or any other sense, and the User shall be exclusively responsible for the User Content. In accordance with this Contract, the Provider shall never alter the User Content on his own initiative, but may do so at the written request by the User and along with a separate written agreement regulating the providing of this service. (a) (a) he is the owner or authorized user of the User Content and that he has gathered all necessary licenses, permits and approvals for using the User Content and all its elements, including but not restricted to all brands, logotypes and names used in the content, without any kind of obligation for the Provider to pay any kind of compensation on any grounds for that and to any legal or natural entity; (b) the User's usage, publishing and presentation of the User Content shall not infringe any copyrights, a patent, brand, business secret or any other intellectual property or property right, nor shall it injure any other right of any other person, including, but not restricted to any kind of contractual, statutory or other rights guaranteed by law or defined by common moral norms; (c) the User shall respect the relevant legislation, rules and regulations that refer or might refer to the User Content, and shall in compliance with this use the WBSP service exclusively for legal purposes; (d) the User shall undertake all reasonable measures to keep the User Content free of computer viruses, worms, Trojans and other malevolent and harmful contents. 5.1. As part of the WBSP service, the Provider shall be responsible for providing the proper functioning of rented web space in accordance with its purpose. This shall not include guarantees for the impenetrability of the presentation protection, the resistance to user mistakes, or the responsibility for possible damages caused by using the service. The complete WBSP service, including, but not restricted to the web presentation, domain registration, hosting services and all documentation related to it, shall be provided "ASIS", without guarantees of any kind, neither exclusive nor assumed. The risk of using the WBSP service and publishing the presentation shall be the User's exclusively. In no case shall the Provider be held responsible for any kind of damage (including, but not restricted to damages from profit loss, interruption of business, loss of business information, or any other kind of loss) resulting from using or the inability to use the WBSP service. 5.2. By providing the WBSP service, the Provider shall not be obliged to provide maintenance services of the User Content which shall be the exclusive responsibility of the User and all subsequent interventions to the presentation undertaken by the Provider shall be done exclusively at the written request of the User and charged separately. 6.1. All copyrights and intellectual property rights of the User Content shall belong to the User without limitations. 6.2. 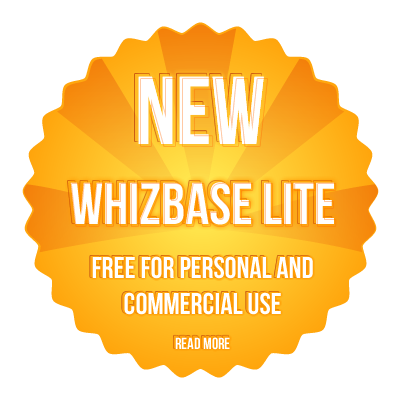 By virtue of this Contract, the Provider shall transfer to the User the rights to use WhizBase license in the period of validity of this Contract. 6.3. Should the published content be contrary to legal, social and moral norms generally accepted by the public (treated generally in section 3), the Provider shall have the right to arbitrarily or by order of management bodies make parts of the presentation or the whole presentation unavailable on all relevant levels. If the parties cannot agree regarding what is and what is not in accordance with the aforementioned norms, the Provider shall have the discretional right to apply his own standards and act accordingly. 7.1 The User shall make payments for using the WBSP service according to a generated order, meaning the full amount of the invoice no later than the deadline stated on the invoice. 7.2 After the expiration of the paid period, the Provider may raise the service price at any moment by sending a written notification via electronic mail ten (10) days in advance. 7.3 The service fee does not include taxes or other obligatory payments to the state. These payments shall be calculated in accordance with the law and shall be listed on the invoice as separate items. The invoice shall be considered paid only if all items from the invoice are fully paid. 7.4 All fees shall be deemed fully earned by the redemption date and irretrievable from the day of the payment. 7.5 Unless specified otherwise, all invoices must be paid within 5 days from the day of issuing. 7.6 Unless the User pays the invoice by the aforementioned deadline, the Provider shall immediately after the expiration of the deadline fully suspend providing the WBSP service. In case of a reactivation of the WBSP service, the User shall pay an additional activation fee along with the regular invoice. The reactivation of the service shall be performed exclusively during regular working hours, from 09:00-15:00 Central European Time, excluding weekends and holidays. 8.1. All amendments to this document shall be done to its electronic version available at the web address http://www.whizbase.com/tos-np.pdf. 8.2. For everything not defined by this document, the provisions of the Law on Obligatory Relations shall be applied accordingly. 9.1. The duration of the provisions put forward in this document shall be established for an indefinite period of time, and they shall enter into force when the User confirms accepting it on-line.